Febrile seizures have been defined by The International League Against Epilepsy (ILAE) as “a seizure occurring in childhood after one month of age, associated with a febrile illness not caused by an infection of the central nervous system, without previous neonatal seizures or a previous unprovoked seizure, and not meeting criteria for other acute symptomatic seizures”. Febrile seizures are the most common seizures in children, occurring in 2–5% of Caucasian children, and 8% of Japanese children. Approximately one-half million febrile seizure events occur per year in the US. Most febrile seizures occur between 6 months and 3 years of age with the peak incidence at 18 months. Approximately 6–15% occur after 4 years, and onset after 6 years is unusual. •	SIMPLE – consists of a generalized tonic, tonic–clonic or atonic activity without focal features, lasting less than 15 minutes, and not recurring within 24 hours (accounts for 2/3 of FS). •	COMPLEX – has one of the following features: prolonged duration (lasting 15 minutes or more), focal features, or seizure recurrence within a 24 hour period or within the same febrile illness. Between 9% and 35% of all first FS is complex. 21% of the children experienced their seizures either prior to or within 1 h of the onset of fever; 57% had a seizure 1–24 h of fever, and 22% experienced their FS more than 24 h after the onset of fever. The diagnosis of a FS is a clinical one. The physical examination in a child with a simple FS should reveal a lack of focal neurological deficits, and demonstrate a fever, generally above 38˚C, although the fever may not be evident until after the seizure. Complex FS may also be associated with transient unilateral paresis (Todd’s paresis) following the seizure. Not all events with fever are febrile seizures. Differential diagnoses include rigors, ‘febrile delirium’ – an acute and transient confusional state associated with high fever, and ‘febrile syncope’, also known as neurocardiogenic or febrile syncope, or ‘breath holding’ attacks. Meningitis, encephalitis, serious electrolyte imbalance and other acute neurological illnesses must be excluded in order to make the diagnosis of a febrile seizure. It should also be noted however, that a child with epilepsy is more likely to have a seizure if febrile. An electroencephalogram (EEG) or neuroimaging are not indicated for simple FS. Other exogenous circumstances that have been identified as predicting an increased risk of initial febrile seizures include difficult birth, neonatal asphyxia, and coiling of the umbilical cord. The risk of initial febrile seizures has also been studied after receipt of pediatric vaccinations such as diphtheria-tetanus-whole cell pertussis (DTP) and Measles, Mumps and Rubella (MMR). A positive family history for FS can be elicited in 25–40% of patients with febrile seizures and the reported frequency in siblings of children with FS has ranged from 9% to 22%. •	FEB1 = chromosome 8q18–q21, autosomal dominant familial FS. •	FEB2 = chromosome 19p13.3, autosomal dominant FS. This region includes the CSNK1G2 (casein kinase I γ 2 isoform) gene, a member of the large casein kinase I family that is involved in vesicular trafficking and neurotransmitter release from small synaptic vesicles. •	FEB3 = chromosome 2q23–q24, autosomal dominant trait. This region is also known as a GEFS+ locus, and mutations in the SCN1A gene (mutation in the α subunit of the first neuronal sodium channel gene) have been reported in GEFS+ families. •	FEB4 = chromosome 5q14–q15. This locus contains the MASS1 (monogenic audiogenic seizure susceptibility) gene; MASS1 is also known as the VLGR1 gene and codes for a large G-protein coupled receptor (_GPR98_). The sequence of the MASS1/VLGR1 gene contains the same EAR (epilepsy-associated repeat) domain found in the LGI1 (leucine-rich glioma-inactivated 1) gene, the gene responsible for autosomal dominant lateral temporal lobe epilepsy. •	FEB5 = chromosome 6q22–q24, autosomal dominant trait. •	FEB6 = chromosome 18p11.2. This region includes the IMPA2 gene, which encodes myo-inositol monophosphatase 2 (IMPase 2). In the phosphatidylinositol-signaling pathway, IMPase is inhibited by lithium, which has a proconvulsant effect, and is stimulated by carbamazepine, an anticonvulsant. GEFS+ is an autosomal-dominant epilepsy syndrome characterized by a variety of mainly generalized epilepsy phenotypes within the same family. The most common phenotypes include FSs and febrile seizures plus, in which FSs persist beyond 6 years of age or associated with afebrile, mostly generalized or more rarely partial, seizures. Four genes associated with GEFS+ have been identified so far: SCN1A, SCN2A and SCN1B, which encode the α1, α2 and β1 subunits of the sodium channel and GABRG2, which encodes the γ2 subunit of the γ-aminobutyric acid (GABA) A receptor. o	an increase of the availability of Na+ channels at subthreshold voltages induced by a decreased slope of the activation curve. A differential developmental expression of distinct Na+ channel subunits could provide an intriguing explanation for an age-dependent occurrence of seizures. There are two common splice variants that are conserved among neuronal voltage-gated Na+ channels, a neonatal and an adult form: NaV1.2 and NaV1.6. The difference is determined by an amino acid substitution at position 209, asparagine by aspartic acid, located in the S3–S4 extracellular loop of domain I. Both channels, NaV1.2 and NaV1.6, are highly expressed at the axon initial segments of pyramidal cells in the hippocampus and cortex but their developmental expression patterns differ markedly. Whereas NaV1.2 channels are expressed early in development with a decrease of the staining intensity and a redistribution towards the proximal part of the axon initial segments at least in some neurons during maturation, NaV1.6 channel expression increases with development more or less replacing NaV1.2 channels, in particular at the distal axon initial segments. A differential regulation of the developmental expression of ion channels, modifying or interacting proteins that alter neuronal excitability, might also apply to explain other age-dependent epilepsy syndromes. •	Interleukin 1 beta gene (IL1B) = Interleukin 1 beta is a major pro-inframmatory cytokine that plays role in inflammatory response and fever. •	Interleukin 1 receptor antagonist gene (IL1RN) = IL-1 receptor antagonist is a naturally occurring anti-inflammatory cytokine which competitively binds to IL-1 receptors, thus modulating the potentially injurious effects of IL-1. •	GABAA receptor gamma 2 subunit gene (GABRG2) = Mutations in the GABRG2 gene were first identified in two families with GEFS+ and in two families with childhood absence epilepsy and FSs. •	Neuronal nicotinic acetylcholine receptor alpha 4 subunit gene (CHRNA4) = Mutations in the CHRNA4 gene, the first gene discovered to cause epilepsy, were identified in families with autosomal dominant nocturnal frontal lobe epilepsy. It has been suggested that the height of the fever and the rapidity of the elevation of temperature are both involved in triggering a seizure. Variations in temperature have effects on most cellular events, and several neurological disorders are provoked by elevated temperature, including febrile seizures and febrile episodic ataxia (calcium channels, CACN1A). Temperature changes have been shown to affect plasma membrane states, ionic channel function, and synaptic transmission. For example, synaptic vesicle recycling has been shown to be temperature dependent: the size of recycling vesicles is twice as large, and the speeds of both endocytosis and exocytosis are faster at physiological temperature than at room temperature. It has been demonstrated that with heterozygous expression, each of these γ2S subunit mutation-containing receptors had reduced γ2S subunit protein surface expression at 37°C and additional reduced surface expression with elevated temperature, suggesting a reduced complement of α1β2γ2S receptors on the cell surface. All three heterozygous receptors had reduced α1 subunit protein surface expression at 37°C and additionally reduced surface expression with elevated temperature. In conclusion, pentameric α1β2γ2S receptors were reduced on the surface, and there was no compensatory increase in cell surface α1β2 receptors when the mutation-containing receptors were challenged with increased temperature. Expression of GABAA receptors containing mutant γ2S subunits is vulnerable to elevated temperature and all three GABAA receptor γ2S subunit mutations showed rapidly compromised receptor trafficking or accelerated endocytosis when challenged with elevated temperature, and this may explain why febrile seizures are provoked by fever in individuals harboring the γ2S subunit mutations. In human infants with FS, the increase in the rate of breathing lead to hyperventilation (defined as a loss of CO2) and respiratory alkalosis. A rise in pH leads not only to an increase in neuronal excitability but often also to epileptiform activity. If one or both of the above approaches turns out to be successful in the clinic, the next step is to make them compatible for use at home. Lipopolysaccharide (LPS) is a component of the cell wall of gram negative bacteria. It has been used to cause fever and the acute phase response in several animal models. LPS can work via several different pathways to signal the induction of fever. Pathway 1. Peripherally LPS stimulates macrophages to secrete pro- and anti-inflammatory citokines. These can act through vagal afferents, perivascular endothelial cells, and circumventricular organs. Ultimately this results in the stimulation of the enzyme cyclooxygenase-2 (COX-2) which then catalyzes the conversion of arachidonic acid into prostaglandin E2 (PGE2) that then acts in the hypothalamus to raise the ‘‘set point” and produces the rise in body temperature that is fever. Some clinical studies over the years have attempted to treat FS by treating fever. The main outcome of these studies was that the use of antipyretics was not effective in preventing FS recurrence. Since antipyretics block the action of COX-2 and thus the production of PGE2, this results indicate that the genesis of FS may involve alternate pathways outside the traditional febrogenic pathway involving COX-2 and PGE2. Pathway 2. Cytokines are produced in response to LPS not only by macrophages in the periphery, but also by microglia, astrocytes and some neurons in the CNS. Some of the key pro-inflammatory cytokines are TNFa, IL-1a, IL-1b, and IL-6. Anti-inflammatory cytokines can include interleukin 1 receptor antagonist (IL-1ra), interleukin 10 (IL-10) and interleukin 18 (IL-18). IL-1ra can block fever when given systemically or centrally (directly into the brain). This occurs by competitive inhibition at the interleukin 1 receptor type I (IL-1RI) that blocks IL-1b signalling, and thus fever. There is evidence from clinical literature that IL-1b may play a role in the genesis of FS. Peripheral mononuclear cells, extracted from children with FS, had a significantly exaggerated production of IL-1b in response to LPS. Moreover, children with certain genetic alterations in the interleukin system, such as a polymorphism in the IL-1b gene cluster, were also more susceptible to FS because of an increase production of IL-1b in cultured monocytes treated with LPS. It is of much interest that ‘‘pro-seizure” ILs, such as IL-1b, have excitatory actions on neurons that mimic those of a brain alkalosis in that they enhance NMDA receptor actions and suppress those mediated by GABAA receptors. The mechanism by which IL-1b influences FS may involve both excitatory (glutamatergic) and inhibitory (GABAergic) systems. •	In terms of excitatory neurotransmission, IL-1b has been shown to influence seizures through alterations in NMDA receptor phosphorylation. A study showed that cultured hippocampal cells exposed to IL-1b had increased Ca+2 influx when exposed to NMDA: the increased influx of Ca+2 was due to phosphorylation of the NR2A/B subunit of the NMDA receptor, which was mediated by Src kinases. This alteration in Ca+2 permeability could lead to increased excitability. •	There is also evidence that IL-1b can influence GABAergic inhibition: IL-1b could decrease GABAA receptor mediated currents in cultured hippocampal neurons. In addition there is also evidence that IL-1b can reduce synaptic inhibition in hippocampal cells. Taken in combination, the notion that IL-1b may concurrently increase excitation and reduce inhibition provides a possible mechanism by which it may promote the genesis of FS. Of course, IL-1b may have a number of other actions that cause increased excitability, including interactions with peptidergic systems in the brain. The IL-1 receptor/Toll-like receptor (IL-1R/TLR) signaling is pivotal for activation of innate immunity and inflammation, and it may occur either following TLR mediated recognition of pathogens, or through binding of proinflammatory molecules such as IL-1b, or danger signals, such as HMGB1, released from activated or injured cells. Considering the mechanisms by which IL-1b is released from monocytes/macrophages, a pivotal role is played by the activation of the inflammasome, a multiprotein complex which includes the cysteine protease ICE/caspase-1. The assembly of the inflammasome is required for the full activation of ICE/Caspase-1 which then proteolytically cleaves pro-IL-1b to produce the releasable, secreted (biologically active) form of this cytokine. Rise in cytosolic Ca2+, and Na+ are instrumental for inflammasome assembly and ICE/Caspase-1 activation, and these ionic modifications are provoked in cells by sustained neuronal depolarization underlying also the generation of seizures. HMGB1 (High Mobility Group Box 1) is a non-histone component of chromatin, and it is ubiquitously expressed in cell nuclei. Although HMGB1 lacks a classical secretion signal peptide, it is secreted also independently upon cell damage after its nuclear-to-cytoplasmatic translocation. Extracellular HMGB1 has therefore dual origin since it can be passively released by cells undergoing necrosis and actively secreted from cells in response to inflammatory stimuli or stressful events. The precise mechanisms underlying HMGB1 release from cells have still to be determined, however intracellular Ca2+ increase and activation of protein kinase C may be required. The proconvulsant effects of IL-1b–IL-1R1 and HMGB1-TLR4 signaling activation is explained by rapid and long-term effects. First of all, there is a rapid post-translational changes in NMDA receptors: the activation of IL-1R1/TLR4 axis induces Src kinase-dependent phosphorylation of the NR2B subunit of the NMDA receptors. In hippocampal neurons, this pathways is responsible for IL-1b-mediated potentiation of NMDA-dependent Ca2+ influx. Thus, increased NMDA function is a crucial mechanism by which endogenous activation of IL-1R1 and TLR4 contributes to seizures, which is compatible with the pivotal role of NMDA receptors in seizure generation and recurrence. 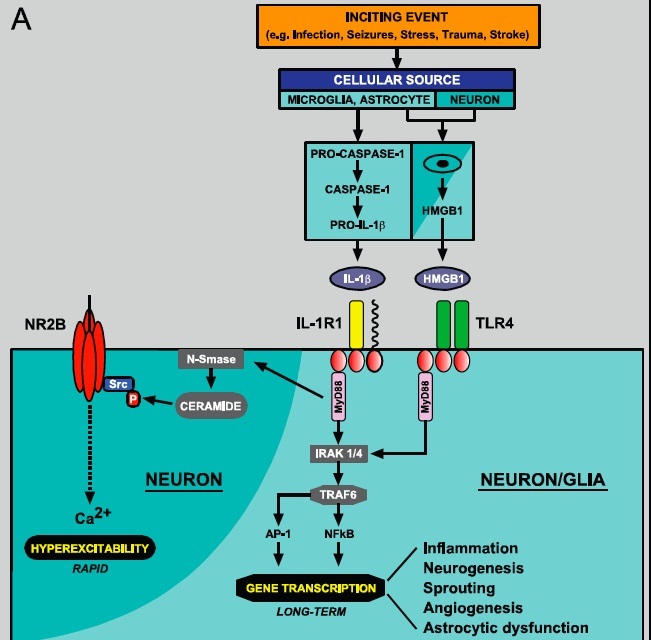 Activation of the IL-1R1/TLR4 signaling may also trigger transcriptional changes which could both perpetuate inflammation via NFkB-dependent transcription of inflammatory genes, and lead to chronically decreased seizure threshold by inducing the expression of genes involved in neurogenesis, cell death, and synaptic molecular reorganization and plasticity. This genes transcription has a longterm impact on neuronal hyperexcitability (e.g. inhibition of astrocytic glutamate reuptake, compromission of BBB permeability function; changes in glutamate receptor subunits expression). Activation of the IL-1R/TLR signaling represents an homeostatic response to brain injury or pathological threats, therefore its involvement in pathologic neuronal hyperexcitability should be envisaged only when an aberrant signaling occurs; this might be the case when the extent or duration of receptor activation is exceeding the homeostatic threshold. The effects of brain inflammation originating by the activation of IL1R/TLR signaling contribute to the generation of individual seizures by inducing a decreased neuronal threshold of excitability. Seizures recurrence, in turn, activates further inflammation, thereby establishing a vicious circle of events that contributes to the development of epilepsy. Low level of plasma ferritin – which occur in iron deficiency – may lower the seizure threshold, as iron is important for the function and metabolism of various enzymes and neurotransmitters present in the central nervous system. Fever may worsen the negative effects of low plasma ferritin level on the brain, and therefore seizures can be triggered. Iron deficiency has been associated with alterations in synaptic neurotransmitter systems including norepinephrine, dopamine, serotonin, glutamate and gamma-aminobutyric acid (GABA). Monoamine and aldehyde oxidases are reduced in iron-deficiency anemia. The structure of the brain can become abnormal because of iron deficiency either in utero or in early postnatal life, because iron is essential for proper neurogenesis, as well as for differentiation of certain brain cells and brain regions. The hippocampus (that encodes memory) and striatum are two areas of the brain identified as morphologically altered in the event of iron deficiency. There is a decreased arborization of dendrites that decreases the number and complexity of interneuronal connections. A second morphological alteration is the location and functioning of oligodendrocytes which are responsible for producing myelin. These cells are particularly sensitive to iron deprivation; deficiency results in an altered composition and amount of myelin in the white matter. •	a family history of FS (first or second degree relative). •	brief duration between fever onset and FS. Several genes have been implicated in epileptogenesis following febrile seizures, including those encoding ion channels, endocannabinoid receptors, and GABAA receptors. Expression changes have also been identified for genes involved in inflammation, synaptogenesis, synaptic transmission, and metabolism. Proinflammatory cytokines, such as TNF-a, IL-6, and IL-1b, can influence neuronal function and excitability in a variety of epilepsy models. 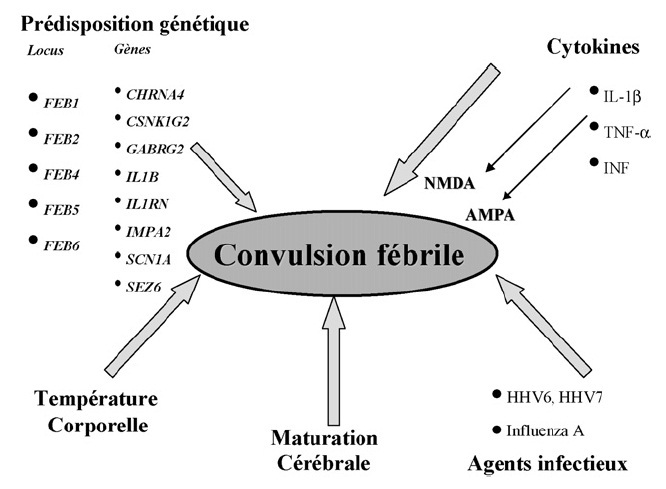 So, febrile seizure-induced early inflammatory responses could have a lasting effect on the constitution of the hippocampal neuronal network, which may contribute to the development of a hyperexcitable state. Some additional pathways may also be significant during epileptogenesis. One such gene is cystatin C, a cysteine proteinase inhibitor. Although cystatin C from astrocytes may protect neurite growth from degradation by cysteine proteases and thus facilitate regeneration, there are also reports suggesting that cystatin C is detrimental to the brain and it functions as a mediator of cell damage. Whether cystatin C underlies the development of a lowered seizure threshold and subsequent epilepsy remains unknown. Findings suggest that febrile seizures occurring early in life could program the epileptogenic process through bifunctional cystatin C activity. Microglial activation can influence neuronal function via the so-called bystander effect, which seems to be caused by the release of a combination of neurotoxic substances, such as glutamate and nitric oxide (NO), and of proinflammatory cytokines, such as IL-1, IL-6, and TNF-a. Microglial activation in limbic structures, the neocortex, and the thalamus last for at least 60 days after febrile seizures. Moreover, normal neuronal activity requires a stable extracellular environment maintained by proper functioning of the BBB. Vasoactive, proteolytic, and chemotactic factors and proinflammatory cytokines might trigger acute BBB permeability changes and modulate neuronal targets. Although it is not known how alterations in BBB permeability contribute to SRS (Spontaneous Recurrent Seizure) following febrile seizures, it is possible that BBB opening and cellular exposure to serum-derived brain toxic components initiate an inflammatory response that eventually leads to epileptiform activity. These hypotheses are critical because they elucidate the relationship of febrile seizures and the subsequent development of epilepsy, and can define novel interventional strategy. The outcome of the experiments conducted using EPO supports the hypothesis that epileptogenesis is tailored by the early inflammatory responses. EPO has been reported to reduce the infiltration of macrophages, production of inflammatory citokines, microglial activation, and BBB breakdown. Furthermore, EPO receptors increased from the early period after febrile seizures and EPO treatment reduces the risk of epilepsy by modulating the early alterations in the expression of multiple genes, including inflammation, and suppressing BBB breakdown and microglial activation. These findings suggest that EPO treatment may provide a new strategy for preventing epilepsy in susceptible individuals undergoing complex febrile seizures. Most FS are of limited duration, lasting fewer than 10 min and no drug intervention is usually necessary. Most simple FS end before the child reaches a physician. Rectal diazepam is effective in the acute management of seizures and is indicated for prolonged attacks, lasting more than 10 minutes, when acute medical care is not accessible. Is there a place for treatment or prophylaxis of FS? The options are ongoing prophylaxis with anti-epileptic drugs (AED), interval antipyretic treatment of febrile episodes, and intermittent AED prophylaxis. Unfortunately, there is no clear consensus regarding these questions. Several studies have demonstrated that valproate and phenobarbitone reduced the recurrence of FS compared with placebo, however the significant adverse effects associated with both drugs limit their practical use. Antipyretic medications such as paracetamol are commonly administered at the onset of a fever. However, there is no evidence that antipyretics prevent further FS alone or in combination with low dose diazepam. Evaluation of child with simple febrile seizure in the Emergency Unit.